Edward Mundy was born in 1794 in New Jersey. He was educated at Rutgers College and graduated in 1812. After practical study, he was admitted to the Bar and practiced in New Jersey. In about 1819, he moved to Illinois and remained there several years. An unfortunate fire caused him considerable loss, and he went back to New Jersey, where he continued for some years in other business pursuits that interrupted his legal practice for a time. In 1831, he came with his family to Michigan and settled in Ann Arbor. Mundy was appointed Justice of the Peace by the Governor. The office was socially important, the position being given to men of some local prominence. He was subsequently made a Judge of one of the Territorial Courts. Mundy had become very well known and respected, and in 1835, was a member of the first Constitutional Convention to prepare for the admission of the State to the Union. As a result of his service, Mundy was nominated to the office of Lieutenant Governor on the ticket with Governor Mason. Mason and Mundy subsequently won the general election. 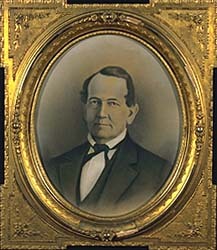 In 1847, Mundy was appointed by the Governor and Senate to the office of Prosecuting Attorney. He went on to serve as Attorney General until his appointment to the Michigan Supreme Court. In 1848, the increasing needs of the state led to the appointment of a fifth justice of the Supreme Court and the creation of a new judicial circuit. At that time the circuit courts were presided over by Supreme Court Judges. The first Bench consisted of a chief justice and two associate justices. A fourth justiceship had been added some years earlier, and Mundy was selected as the fifth justice.